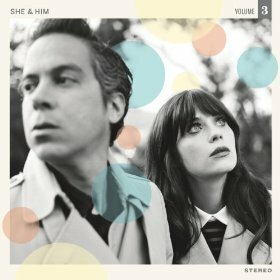 There are many things about She & Him that contribute to a dismiss of novelty. Zooey Deschanel is the face of the band, a face that is tied to the glamorous hipster indie rock babe, too quirky for television, with famous bangs. Their last album was a Christmas album. The inclusion of M. Ward, folk guitar virtuoso, keeps the critics back and adds credibility, moving away from novelty into lighthearted fun and reinvention. She & Him is about an aura of nostalgia, built for a simpler music and sweeter voice. M. Ward is complimentary with his guitar notes. There is nothing about Volume 3 that feels heavy, despite the bitter longing of broken relationships and haunting love. The only fault is the condition of having too much of something so sweet. Volume 3 lingers in the brain with its delicious lyrics and orchestration, and it sticks and sticks until there is an overwhelming stickiness of vocals filled with a surreal innocence and love.